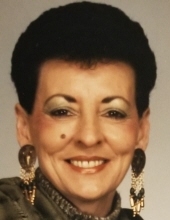 Lula Deaner Adkins Collins, 77, departed this life on April 6, 2019 at Rocky Mount Health & Rehab, Rocky Mount, VA. She was a former resident of Parker Road, Danville, Va. She was born September 14, 1941 in Pittsylvania County, Va. to the late Lessie Haley Adkins and the late Tommy Jackson Adkins. She was married to the late Van Collins. Deaner worked at the Gingerbread House for a number of years and was of the Christian faith. Survivors left to cherish her memories include three sisters, Ethel Poindexter of Snow Creek, Va., Leara Rigney of Danville and Burnice Eversole of Florida, and a brother, Tommy Michael Adkins of Martinsville, Va. In addition, she is survived by a number of nieces and nephews. In addition to her parents and husband, Deaner was predeceased by a daughter, Tammy Lewis, two sisters, Katherine Herndon and Elizabeth Motley, and two brothers, Fillmore and Dewey Adkins. Graveside memorial services will be held at 1 p.m. Friday, April 12, 2019 at Highland Burial Park, Danville, Va.
To send flowers or a remembrance gift to the family of Lula Deaner Collins, please visit our Tribute Store. "Email Address" would like to share the life celebration of Lula Deaner Collins. Click on the "link" to go to share a favorite memory or leave a condolence message for the family.